1. Do you remember the first blog you started following? If so, who & why did you keep going back for more? 2. Pretend you are 16. Being able to look ahead at your life now, what would you, at 16, have found most shocking or unexpected about the life you ended up having? 3. As a child, what did you want to be when you grew up? What would you be now if you could do it all over again? Enjoy the Party and have a great week! Aww I puffy heart Amy... love, love. Blog hopping is so fun, and addictive. There are just so many great blogs out there and not enough time to get to all of them! I know you can get your degree my dear, you can do it! Oh *hugs* I love you. I love your passion. It is wonderful to see how you could turn your childhood experiences into fuel for your drive to help other children that might be in the same position and situation you were. You're just an inspiration - I hope you know that. 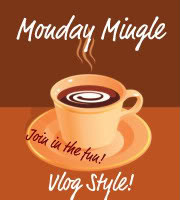 The Monday Mingle looks like a blast. I am going to read through some more, not sure if I will jump in anytime soon, kinda shy, but watch for me, I just might show up. Thanks for stopping by my blog today!!!! Awwww I'm speechless. I don't know if I could do what you do like that. First of all how do you do the camera thingy? The other thing is I guess I have to pick & choose, which meme's I do because right now it's the busy season for typing & making money. The other thing is come on girlfriend, I barely learned this party thing. Thanks for the help by the way. I surely hope I did it right. HUGS to you and the BB's!!! You can SO GET YOUR DEGREE!! Hold your breath and jump right in sweetheart it's not as scary as you think it's going to be and it's actually a really refreshing change. Lovely seeing you again this week dear :) Have a wonderful week! I was very moved by your vlog. I will pray for you. Sometimes it takes a long time to heal. Some hurts go very deep. Jehovah Rapha, please bring Your healing touch to the deepest places in Collette's heart, places she doesn't even know about, and heal her, and hold her very close. And please heal the memories, Lord. In Your Precious Name I pray, Amen. Thank you for visiting my blog Faith's Firm Foundation, and I hope you will come back. Hi! You've got a great site here! Stopping by on the UBP10 whirl wind! Thanks for having me over. :) Stop on by my place if you have time! That was one of my first blogs too, I'd love to have more time to get there more often. You can finish one day, hun - YOU CAN!! I'm rooting for you! I considered a social worker too, yet wasn't sure if I could keep my emotions out of it - so hard to deal with, but so rewarding! Sending you many hugs, girl!!! Have a great week, Happy Mingling! I love the picture of your kids in the laundry basket watching TV, my kids used to do that. LOVE THAT!! Just stopping over from the blog party, thanks for stopping by my blog.